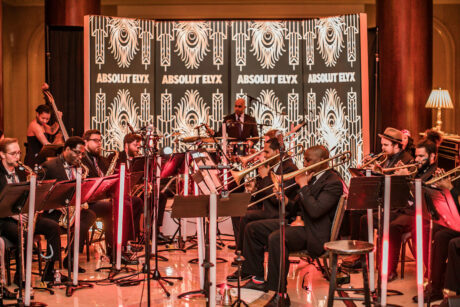 NEW ORLEANS – Amidst the thousands of celebrations happening world-wide for the 2018-2019 roll over… the New Orleans Jazz Orchestra (NOJO) played a very special Great Gatsby themed party in the super-plush lobby of the Ritz-Carlton Hotel in Dallas, which required diligent lighting to produce the correct ambience. 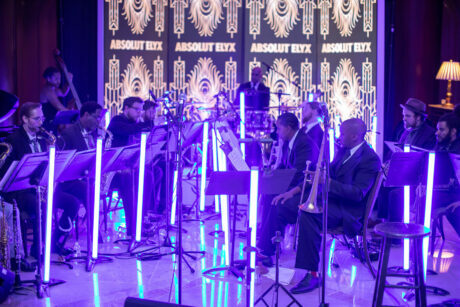 Endeavoring to maintain an atmosphere of elegance in the marble columned lobby with its intricate deep blue and gold Texas flower petal carpets and other bespoke features while loading in, positioning and rigging fixtures was another galvanizing task for Eric and his crew! This included his sons Aaron and Brandon Wade, both Oklahoma University Drama department students who have toured extensively during the summers. Randy is also sold on Robe. He and business partner Taylor Hobart recently established Time Matters Entertainment’s TMELED.com rental shop – to service both existing and new accounts due to Randy’s many years working as a show producer and general contractor. This new venture has made some serious investment in Robe including BMFL Blades, LightMaster side mounting kits (to facilitate their use as follow spots), RoboSpot BaseStation & MotionCamera systems (for remote follow spot operation), Tarrantulas, MegaPointes, DL7S Profiles, DL4F Washes and LEDbeam150s.